One of the nice things about being a member of the male species is the low standards people have for us when it comes to cooking. Apparently there are men who like cooking, as the lion’s share of the famous chefs we see on cooking shows are men: Gordon Ramsey, Jimmy Flay, etc. Where these men come from I have no idea as basically all the men I know love eating but have little affection for cooking. When people eat food a man cooked, he gets reactions like, “You made this? I’m amazed.” When I was single and in college I went to a Bible study that was mostly young families. When it was my turn to bring the dessert, I baked one of those “box cakes”–a pre-made mix requiring minimal additional ingredients. The directions state: add an egg, add oil, mix, bake. Directions even a highly-literate university student would have trouble messing up. Nevertheless, people at the Bible study were impressed. For ladies, unfortunately, people are much harder to wow: “You made this? You know, my grandmother has an excellent recipe for stuffed chicken breasts. I’ll have to send it to you.” (i.e. your food is sub-par). I never intended to do much cooking, but then morning sickness happened. When Abby was pregnant with our first, she didn’t want to be around food, much less make it. For me it was learn or starve, so I started cracking open the cookbooks. I stuck to some basic recipes: spaghetti, fried chicken, chicken noodle soup, more spaghetti, etc. We survived pregnancy on a small repertoire of not-so-healthy meals and planned on things returning to life and food as usual. But then Abby had to work in order to get a visa. I was back to cooking one or two evenings a week. Back to the cookbooks. Of course, even I get tired of spaghetti, so I branched out a little. Sometimes my forays met with success, sometimes not. Our visa situation stabilized and Abby stayed home with baby number two. Did my cooking career end? No. With Abby staying up all night nursing, I found myself alone at the breakfast table with a hungry two-year old. Let’s cook…breakfast. It’s become tradition in my house now for me to be responsible for breakfast. I have to admit I’m still not terribly creative; we have pancakes at least once or twice a week whether everyone likes it or not. I realize that every family is different and God gives freedom in how labor is divided in a household. Some men never cook and that’s fine. 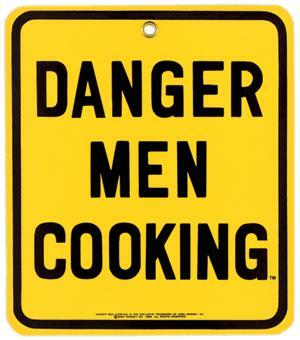 However, if you are a man who is inclined to take a crack at cooking or if the responsibility to cook has been unexpectedly thrown on you, here are a few words of advice based on my experience. 1. Follow the recipe. Bill Cosby said his gardener made the best Thanksgiving stuffing. When Cosby pushed him for the secret, the man said, “Stovetop stuffing. Follow the instructions on the box.” I would strongly suggest following the recipe at least once or twice before you try to improvise. Learn to walk before you run. 2. Use your gender to your advantage. Whenever possible, hide behind the fact that you don’t know what you are doing and at least you are trying. Wife: So you put the spaghetti noodles in cold water? Wife: How did you expect them to cook? Wife: Thanks for trying. At least the sauce from the can tastes good. 3. Embarrass your friends. I brought “blondies” (i.e. brownies without the brown) once to a potluck. I think blondies were invented by someone like me who was late to a potluck and all they had on hand was flour, sugar and butter. I threw them together quickly because Abby was busy somewhere and, well, it’s just not cool to bring nothing to a potluck. The host told me, “Do not tell my wife you made these.” When the secret leaked out that a man had actually baked them, you can imaging the marital strife that ensued. 4. If all else fails, fry it. Once you move beyond the “follow the recipe” stage–and eventually you will–you’ll find that there are a lot of options out there. But as a man who doesn’t cook very often, it’s important to me that it tastes good. If you cook seven days a week, one or two flops are okay. But if this is your only shot for a while, it’s better to play it safer. A few safety nets I’ve found are butter, oil and sugar. Next time you eat something you like, pay closer attention. It’s probably got a lot of at least one of those three ingredients. 5. Avoid health food recipes. Any recipe that starts with “I was trying to create an alternative to (fill in the name of a normally yummy food here)…” should be avoided. Sure your wife is on a diet. Sure you just watched the Biggest Loser. In my experience, it is very difficult to make health food recipes taste good. If you are only going to be cooking a few times a month, you might as well make it count. 6. Follow the crowd. With the increasing popularity of crowdsourcing and ratings and stuff like that, it’s pretty easy to pick a recipe that lots of people like. If a recipe you googled has five stars from four thousand people, chances are it’s pretty good. Stick with what works. 7. Get the All Recipes app. I got a comment about being “so domestic” because I have that app. But it uses the power of the Internet to and ratings (see point 6) to provide thousands of recipes at the touch of a button. Honestly, I hardly ever crack open the cookbook anymore. Joy of Cooking is so 2010. 8. Use your budding culinary skills to improve your marriage. In my experience, no wife is more thankful than a wife who didn’t have to cook (or clean up the mess afterward). If you can do a halfway decent job on the food, gratefulness will make up for the fact that it’s not extraordinary. It was my turn to cook yesterday for our weekly stay-at-home date night. I took my own advice (see point 4) and made sopapillas. 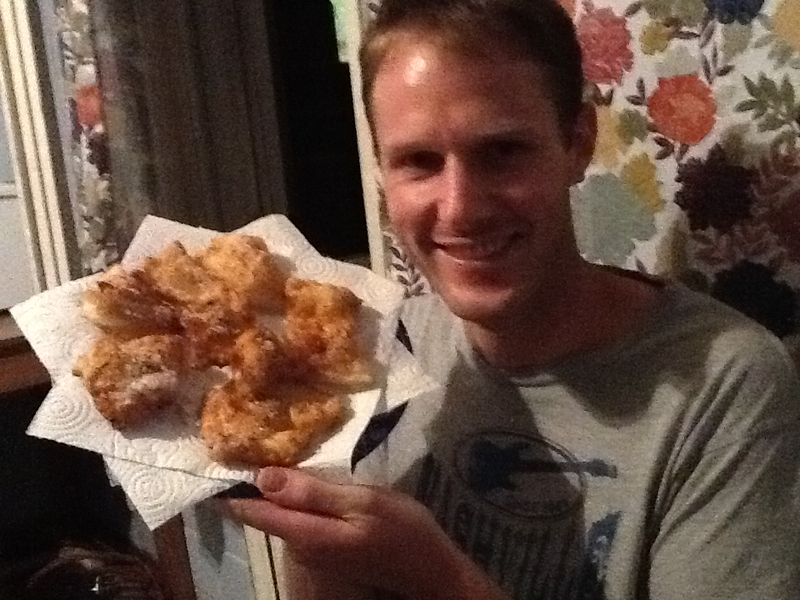 Fried bread–nothing finer, especially when you add cinnamon and sugar. Next Next post: Young, rich and powerful–what more could he want?